Good things come to those who go to art benefits. The Momenta benefit operates as a raffle -- you pick a work among those remaining when your name is called. This time we had three tickets, and one of those was drawn first. We chose the Kiki Smith work pictured above. We also got a painting by Joey Kotting and a mixed media/collage work by Michael Cambre. It was one of our best experiences ever at such an event. Tomorrow (Wednesday May 5) we're going to Groundswell's benefit. Tickets are $100 or 3 for $250 for the art raffle, or a minimum of $15 to go to the party. You get to a good party with a cool art crowd, and it's a good cause. Groundswell brings artists and members of a given NYC community together to create a permanent mural in their neighborhood. More info on them is here. I remember Kiki Smith. She came to Alfred (where I went to school) as an artist-in-residence in 95. Never did have the opportunity to work with her (litho-grad students.. lucky bastards got the most exposure with her) but was intrigued by the duration of some of her pieces/processes. Was she at the event? She's a trip. No, she wasn't at the event, but I did see her when I went to the Whitney Biennial. A couple of cute young gay guys went up to her to say, "Oh my god! 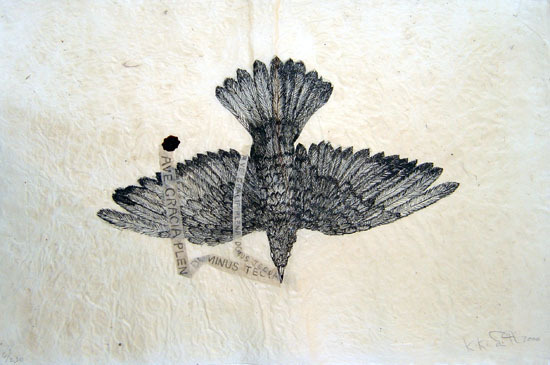 You're Kiki Smith! We saw you on Art:21 on PBS!" She seemed amused, and said to her friend something like "it's TV that makes you famous." James corrected me. This happened at the Scope Art Fair, not at the Whitney Biennial. Published on May 4, 2004 1:00 PM.